I’m a traditionalist in some ways. I like roses. They’re pretty, they’re romantic, they smell nice and they even taste good (some of them, anyway). I’ve never been fond of the fusspot hybrid teas, which my dad used to drench in stinky, poisonous malathion to save them from a platoon of bugs and diseases. And the Royal Botanical Garden (RBG) in Burlington, the largest botanical garden in Canada, shares my views. They’ve ripped out their 50-year-old rose garden and started an entirely new one. Now, the RBG works on a huge scale and mountains of chemically treated soil was removed and replaced with clean soil and compost. More than 3,000 new roses were planted, chosen for cold-hardiness, disease resistance, drought tolerance, and overall ease of care. But just because they do things in a big way doesn’t mean you can’t do the same thing in your own small garden. You can learn a lot of things from the RBG’s new beds of roses. One of the things that impressed me the most was that the RBG rose garden is no longer bed after bed of roses growing in snooty isolation. 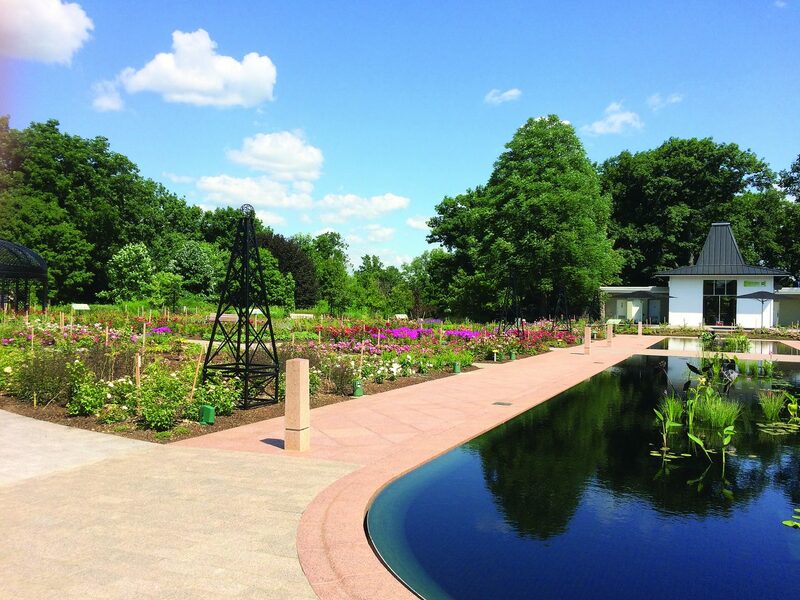 The new garden mixes perennials and even herbs among the rose bushes. Native pollinators like purple coneflower (Echinacea) pop up frequently, and I was startled to see drifts of dill here and there. “Dill is a host plant for the tachinid fly, an enemy of Japanese beetles,” explains Alex Henderson, RBG’s curator of collections. He added that the perennials were also added to give visitors an idea of how to use roses in their own mixed flower gardens. “The colour transitions between beds are important,” he added. So instead of seeing blobs of red and pink and yellow here and there, you walk into a rainbow of colours, moving from yellow to orange and peach to pink to red. With a reflecting pool running down the middle of the fan-shaped garden, it’s a stunning display. Plants, ecological awareness, climate and budgets have all seen dramatic changes in just the last couple of decades. Ontario’s 2009 pesticide ban delivered a huge blow to the old-time roses that needed sprays, dusts and constant clean-up. All those elements contributed to the garden’s makeover. Fortunately, many new roses are being bred to be disease-resistant and less labour-intensive. They don’t demand as much deadheading and pruning, so only three full-time gardeners take care of the RBG’s roses. Miles of underground pipes deliver drip irrigation directly to the roots, saving water and encouraging them to grow down deep, safe from cold and heat. The rich soil in the beds takes the place of artificial fertilizers, reducing runoff to nearby waterlands, and a three-inch layer of mulch caps everything off with a thick, protective blanket. Work on the garden began in 2017, and opening day was set for summer 2018. But there was one last glitch to work through. As you may remember, last spring’s weather brought surprise cold snaps, freezing rain and even hail, so planting the two-and-a-half-acre garden was delayed for weeks. Everyone wondered if the young shrubs would bloom this year—and yes, they did—making a spectacular appearance for opening day in June. And they’re still there, waiting for you to come by and say hello. The rose garden at the Royal Botanical Garden is one of several gardens within Hendrie Park. Enter (admission fee) and park at the RBG Centre located at 680 Plains Rd. in Burlington. The gardens are open 10 a.m. to 8 p.m. Refreshments are available afternoons at the Greenhouse Café in the main building or the open-air Turner Pavilion teahouse in the rose garden.